Javier Cercas, Soldiers of Salamis. Javier Cercas discusses The Anatomy of a Moment. ; Santiago Roncagliolo discusses Red April. Since 1989, Professor of Spanish literature at the University of Girona, Spain. He is a frequent contributor to the Catalan edition of El País and the Sunday supplement. He worked for two years at the University of Illinois at Urbana-Champaign in the United States. Javier Cercas's book The Anatomy of a Moment was available from LibraryThing Early Reviewers. 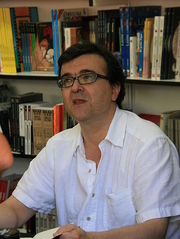 Javier Cercas is currently considered a "single author." If one or more works are by a distinct, homonymous authors, go ahead and split the author. Javier Cercas is composed of 7 names. You can examine and separate out names.